"The first pipe on the planet" Theodosii Spassov presented its latest non-standard program. This time the plays are recorded with the Big Band of the BNR. Against the background of large-scale sound stand out, and two works for flute and piano. 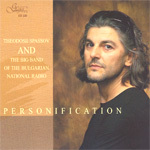 Theodosii Spassov was the first Bulgarian musician who cleverly combined the Bulgarian folk music with other genres - mostly jazz. 04 Nostalgy for the Village 5'08"
05 Nestinari (Fire Dancers) 4'02"
06 You Are not Alone 2'53"
07 Tuesday, 1st of April 4'37"
09 Ballad of a Puffed-up Gaida 4'30"
12 Dobrudja Tease Song 2'13"
13 Better Get it in your Soul 4'14"